From the moment the band struck up with “Another Opening, Another Show” the audience at the 2017 Gang Show knew they were in for a great evening’s entertainment. 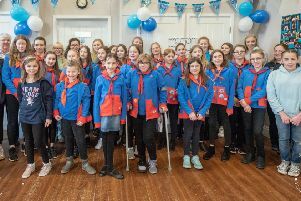 Dozens of Scouts, Guides, Brownies and Cubs were an excited audience in a very full Royal Hall. They were not to be disappointed. The Gang Show was the brainchild of Ralph Reader and has been performed by generations of Scouts, and more recently Guides and Scouts, since 1932. Over 80 of them from across the Harrogate District put on a very fine show. There were no auditions, The organisers welcomed a cast willing to put heart and soul into rehearsal and performance and the result was quite remarkable. The programme featured musical numbers and sketches all delivered with a most professional slickness and polish. There were so many highlights and everyone got a chance to shine. The first half included a most accomplished duet and a beautiful solo amongst the musical numbers. Brush up your Shakespeare introduced a Shakespearean themed medley. Lively musical numbers were interspersed with excerpts from the plays delivered with aplomb by a juvenile Lady Macbeth, Rome, Juliet and Ophelia! Then a Brush up your reading medley with spectacular scenery features more great routines. It was, however, The Beavers and Rainbows who once again quickly established themselves as audience favourites in an unbelievably enthusiastic “We’re all going on a Bear Hunt” complete with giant Bear. Space does not permit a description of all the acts. There were more wonderful medleys including a magic sequence and cleverly choreographed dance and movement routines. The comic interludes were very funny, particularly an ongoing Wicked joke. This was the best Gang Show yet. The costumes and scenery were all superb and the cast were on top form and bursting with talent. It was a great fun filled evening. The youngsters were well supported by an an excellent band of local musicians led by Esther Woods, who was overall musical director. But praise indeed must go to director Mark Edwards and his team for their imagination and vision in training 80 local youngsters to such a high standard and giving them the opportunity to shine on stage. Scouting and Guiding are always inclusive and offer you people a wealth of opportunities. The audience will remember this show for a long time. The Scouts and Guides and the youngest Beavers and Rainbows will never forget the experience. So along with the Gang we echo, “Thank for the Music”.